Here we are with the third day of our photography tutorial, hope the first two were insightful enough to get you thinking to use your camera's manual mode with confidence. Question 3/ Day 3 - WHAT IS THE LIGHT DOING? It is challenging to make good photographs without a good understanding of how the ISO works and what it does. The camera ISO is one of the three pillars of photography (the other two being APERTURE and SHUTTER SPEED) and every photographer should thoroughly understand it to get the most out of their equipment. So, what is ISO? In very basic terms, ISO is the level of sensitivity of your camera to the available light. The lower the ISO number, the less sensitive it is to the light, while a higher ISO number increases the sensitivity of your camera. The component within your camera that can change sensitivity is called “image sensor” or simply “sensor”. It is the most important (and most expensive) part of a camera and it is responsible for gathering light and transforming it into an image. With increased sensitivity, your camera sensor can capture images in low-light environments without having to use a flash. But higher sensitivity comes at an expense – it adds grain or “noise” to the pictures. 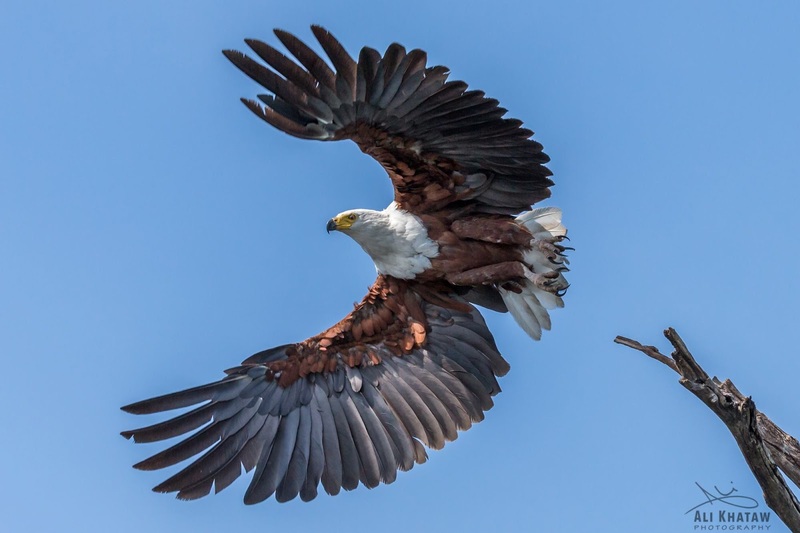 This image of the Fish Eagle was made on the Chobe River in Botswana. While meandering through the river looking for wildlife, I saw this magnificent Fish Eagle sitting on a dead tree limb. It was eagerly looking for a fish down in the water. My goal was to capture this magnificent bird in flight. I then quickly set up my camera and lens on a tripod. Next I set the exposure to “Spot Metering” and changed the Shutter Speed to 1/2500 of a second which I use commonly when photographing birds in flight. Anything slower would create a blurred image. I then focused on the eye of the bird and set the shutter to burst mode. Now, it was all about being patient and waiting for the Fish Eagle to take off. After about 30 minutes, following sudden excitement, the Fish Eagle took off. I followed it with my lens using the tripod to make the panning smooth. The following frame was one that actually had the wings wide open and no shadows cast on the Fish Eagles face. The image was made using 800 ISO. Typically one would expect some grain to be visible but since the new cameras have amazing digital sensors, one can easily shoot up to 3000 or more ISO without visible grain. Hope you found this helpful! Stay tuned for tomorrow when we will discuss COMPOSITION AND RULE OF THIRDS.